A quarter of the land in the northern hemisphere is permanently frozen, but it is beginning to thaw. Large quantities of methane lie locked in natural gas deposits, permafrost and ocean floor clathrates in the Arctic. The thawing of these frozen gas stores is one of the most serious scenarios for an abrupt acceleration in climate change, as Methane is 23 times more effective than carbon dioxide at trapping the sun's heat. The IPA defines permafrost as 'ground (soil or rock and included ice or organic material) that remains below 0°C for at least two consecutive years.' These grounds cover almost ten percent of the earth’s land area, storing estimates that range between 25 and 50 percent of all organic soil carbon in the world. It is also estimated that the frozen permafrost soils contain double the amount of carbon currently in the atmosphere. Scientists from NASA have measured the greatest climate warming on earth in the Arctic. In Siberia, a NASA team led by Dr. Jon Ranson have stated temperatures have risen 1 to 3°C (3 to 5°F) over the past 30 years. Permafrost ice accounts for 60 percent of Russia's terrain and can be millions of years old, Siberia also has some of the thickest at 1,400 metres deep. The methane discussion in the scientific community now focuses on trying to figure out how much gas these frozen grounds contain and what will happen as they further melt. Surface permafrost ice layers usually thaw in summer but remain frozen under the surface, giving the ground stability. 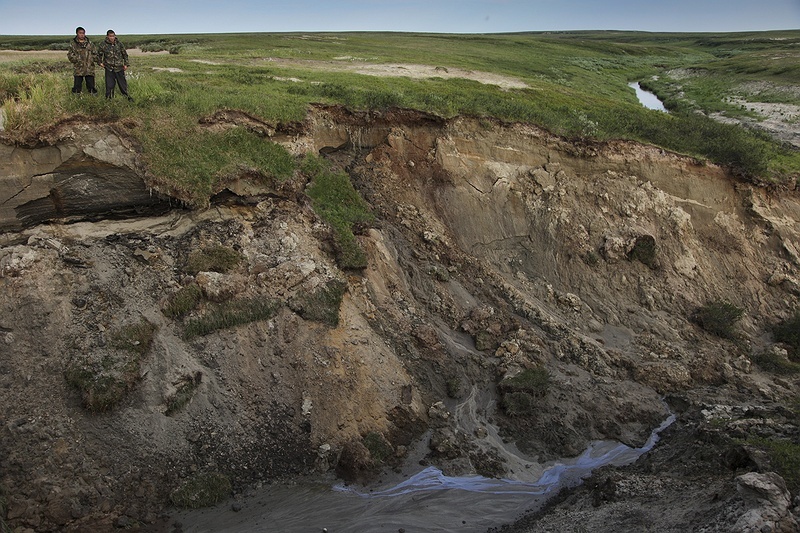 60 percent of Russia's landmass is permafrost and all over Siberia the ground has started to move as the earth heats up and the thawing reaches deeper levels. Buildings, roads and power lines have been destroyed. In some places mountainsides and land areas have completely collapsed. Pools with mounds of once supported earth called thermokarst lakes are prevalent in the landscape. Sand and rock held once held together by ice has shifted and changed the shape of the surface. The formation of these lakes is a growing source of atmospheric methane today, releasing prehistoric carbon back into the atmosphere as the ice melts. The Russian scientist Sergey Zimov has been studying permafrost for more than 30 years and is head of the North-eastern Research Station in Cherskij. “When I was young the average temperature of permafrost in our sites was -6, -7 degrees Celsius, now it is already -3. When it becomes 0 it will be very hard to stop the process”, he says, "we are at a turning point."